The Geunjeongjeon (main palace) building of the Gyeongbokgung Palace in Seoul, also known as the Palace of Shining Happiness. Add tags for "The Geunjeongjeon (main palace) building of the Gyeongbokgung Palace in Seoul, also known as the Palace of Shining Happiness.". Be the first. <http://www.worldcat.org/oclc/841444973> # The Geunjeongjeon (main palace) building of the Gyeongbokgung Palace in Seoul, also known as the Palace of Shining Happiness. 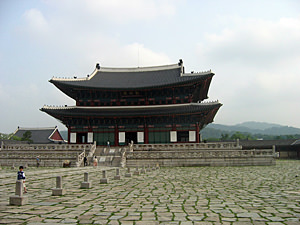 schema:about <http://www.worldcat.org/oclc/841444973> ; # The Geunjeongjeon (main palace) building of the Gyeongbokgung Palace in Seoul, also known as the Palace of Shining Happiness.